A survey from the Health Insurance provider AXA PPP International has reported the main drivers behind British emigration abroad. Poor work / life balance and poor pay and benefits were cited as the main drivers for leaving the UK. Other push factors included climate and the economic outlook of the UK. The results show that quality of life is a key consideration for British migrants and they are willing to relocate overseas to achieve it. Many of today’s aspiring expats will be relocating with their partners and children and their perceived dissatisfaction with life in the UK and their ambition for a better quality of life are driving their considerations. The study also found that 45% of British were emigrating with children, 13% were emigrating on their own. 61% had a job in place prior to moving, therefore 39% do not. The survey also found that 75% of those relocating are planning to learn the new language of their host country. Learning the language can significantly assist with settling in and to reduce culture shock. Many organisations when relocating employees will provide language classes and assistance to help expats settle in. It was also reported that 43% of those surveyed plan to socialise. Socialising and meeting new people can also greatly enhance a new migrants experience of settling in and can help them to start to build a support network in their new home. 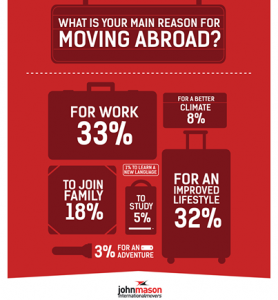 A survey undertaken on our own website found that work was also the main reason for moving abroad. The ONS Long-term International Migration Nov 2013 report also found that in 2012, the most common reason to emigrate was job related and 73% of those moving due to a job moved to a non-EU country. It is worth noting that UK emigration is currently at its lowest level in a decade according to the ONS. In total 320,000 left in the year June 2012 – June 2013 (ONS Long-term International Migration statistics – November 2013). This is a fall of 29,000 compared to the previous year. Out of the 320,000 emigrants, 141k were British, 50k were from old and new commonwealth countries, 74k from EU countries and 51k from other countries.